Home Uncategories We Wish You a Selfie Christmas and a Happy New Year! We Wish You a Selfie Christmas and a Happy New Year! The festive week is just around the corner and it’s about time to bid good bye to 2016. So, we thought of ending the year 2016 on a fun-filled note with an exciting contest and yes, you could stand a chance to win loads of free wallet cash! 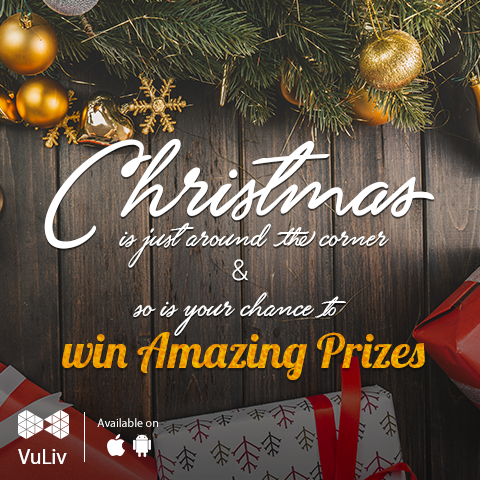 All you need to do is find a good looking, handsome Christmas tree around you, click a selfie, tag VuLiv Media Player in the picture with #mychristmasselfie, share on your Facebook wall, ask your friends to like and share your post and don’t forget to like our page, VuLiv Media Player (without liking the page, you cannot tag VuLiv Media Player in the picture). Contest starts from the 25th of December 2016 and closes midnight 31st December 2016. What are you waiting for, start looking for a Christmas tree right away and bag home loads of free wallet cash.